Our retail POP kiosks give household products, such as fireplaces, a touch of welcome cachet that highlights their unique quality and beauty. We strive to present your products in the best possible light by creating expertly-crafted display units that give your items an inviting appeal. At Avante, we’re proud to have created stunning retail POP kiosks for some of the best manufacturers around, including Fruit of the Land Food and Body Glove. 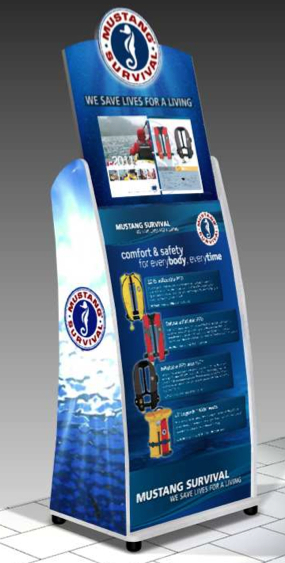 Our Body Glove retail kiosks feature all of the bells and whistles, including press-on, non-removable graphics in an exciting metallic finish, two-sided display for 360-degree visual impact and a modern color palette of sunny neon yellow, gleaming silver and sophisticated charcoal grey. Whether you’re marketing fireplaces, wetsuits, or gourmet food treats, you’ll find that we have the skills to boost your sales and enhance your public image. Since we customize our retail POP displays to your exact specifications, we create the mood and ambiance required to build your brand effectively and to push the merchandise. From sleek and modern, to traditional and classic, we tailor our retail POP kiosk designs to your needs… and to the needs of your “ideal” client. By offering you the best at a truly great price, we open up new connections between you and your target demographic(s). Whether you’re a product manufacturer or a marketing guru, you’ll love the way that we add value to what you promote by encasing it in high-quality wood cabinets that give prospective customers the ability to visualize your products in their own homes or commercial spaces. Without the right Avante retail POP kiosk, you may not get the product placement you need to drive sales and make the most of your marketing campaigns. Our point of purchase displays act as the final piece of the marketing puzzle. They are such an affordable way to build rapport between your merchandise and the people who want to buy it. 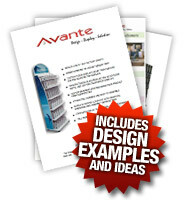 Clearly, Avante retail pop kiosks are the best choice for your business. Since 1989, we’ve been crafting these reasonably-priced units for a range of manufacturers and marketing companies. We have the sort of experience that you need and we work hard to provide you with stellar customer service on every single order. To offer you the lowest prices per unit, we’ve created a factory-direct business model that decreases the cost of ordering our retail POP display designs. In addition, we are proud to provide low minimums for superior cost effectiveness. We know exactly how to package our items to give you access to the lowest shipping costs. Each unit we manufacture will be flat-packed, totally courier-friendly. Since all of our service happens in-house, we offer all-inclusive design, manufacturing, and printing for a complete turnkey experience. If you’ve been mulling over the benefits of ordering retail POP kiosks for product display, you should know that there’s no time like the present to take action. By working with our team of creative and technical experts, you’ll access the sort of quality that enhances the public image of your business, and you’ll put prospective customers up close and personal with your products. When it comes to standing out in a retail environment, point-of-purchase display units are a perfect method of setting your products apart. If you implement only one new marketing gambit for your product this year, choosing Avante retail POP kiosks should be the one. 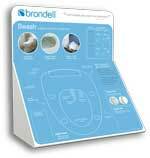 Call or email our point of purchase display specialists today for more information. We are waiting to hear from you, we are standing by, to help you grow your business with the ultimate retail display units.